In the face of a volatile economic climate, global competition and constant change, companies are looking for ways to differentiate themselves. The companies that thrive understand that great talent is essential to success. North Highland believes that businesses made up of people with the right blend of capabilities and conviction can do amazing things. Let us help you perfect your organization, stimulate talent potential and inspire change. Change is the new normal, but unfortunately, so is the failure of most change initiatives. So why take the same old approach? We help demystify how to make change happen on the ground, applying logic and creativity. Whatever the nature of your change initiative, we can help you inspire change, engage your people, and accelerate business results. It’s critical that leaders adapt organizational models to keep pace with the speed of innovation and operations. We help clients design an organizational structure that drives business strategy through organizational structure and strategy design, competency definitions, operating processes, and job and career frameworks. Cultural change requires intentionality and vision. We believe that this change starts by understanding the current climate including both spoken and unspoken perceptions, and continuing to build against a set of six cultural levers: vision, values, behaviors, language, systems, and recognition. Talent is an organization’s single largest expenditure and most defining asset. High-performing businesses are rethinking their attitudes and actions on managing their talent. We help our clients improve how they plan, source, attract, engage, develop, reward, and mobilize their employees and leaders to maximize performance and capitalize on the potential of their workforce. In a business environment characterized by game-changing transformation, strategic change initiatives are constant and pervasive. We offer change management as a managed service, with a keen focus on your workforce’s engagement, for clients who require a dependable pool of change management practitioners that can execute sustainable change programs while raising the collective bar of an organization’s ability to effectively transform. A crisis can hit any company at any time. Scandal, failure, a bold new competitor, a rough earnings report, a poor product rollout - today, even companies with long track records of success are highly vulnerable to sudden turns of fortune. A leading retail distribution organization was looking to become an innovative leader in the consumer products industry and had developed a three-year strategy to prepare them for an initial public offering with a focus on the development of a digitization and analytics ecosystem. We partnered with Harvard Business Review Analytic Services to find out how organizations around the world and in a variety of sectors are addressing the reality of continuous change, interviewing executives from multiple sectors who are intimately involved with their organization’s efforts to promote resilience. A recent survey North Highland co-sponsored with Harvard Business Review shows what many of us are seeing and feeling in our jobs – constant change. The pace of change in the workplace is accelerating and having an increasing impact on us as individuals and employees. Given this, it is critical we increase our individual and organizational capacity to be resilient – to enhance the skills and processes that enable performance under stress, continuous learning, and work / life balance. Thoughtfully achieving transition objectives requires an understanding of how change is already affecting your organization. This blog is the first in a series on change saturation, in which North Highland shares perspective on three ways organizations can drive better results. People often ask how they can prepare for changes they didn’t anticipate and manage their lives given increased complexity. Especially at work, we have to deal with one change on top of another. Today, change is the status quo. Fueled by evolving technologies, increased market competition, and shifting customer expectations, it’s not unusual for an organization to navigate multiple, large-scale transformations at a given time. Don’t shy away from the size of the challenge, it’s all about taking that first step and being clear about your destination. And remember to be deliberate, get specific, and start small. Why are agile projects generally successful while enterprise agility is so arduous? This is because they are vastly different undertakings requiring wholly different approaches to change. Regular transformation has become a requirement of survival, and the ability to successfully and quickly change—our cultures, customer experiences, technologies and business models—is a mandatory core competency. Organizational change has a reputation for being painful and often unsuccessful. However, it doesn't have to be that way. Structuring your change efforts using what we know about how people actually think will make change easier and adoption more likely. When you do so, your change plan will probably look different and work better. During disruptive changes in an organization, HR professionals and consultants often talk about “managing change,” “dealing with resistance,” and “gaining buy-in.” As a business leader, though, your job is delivering business results. Dealing with change, resistance and buy-in are means to that end. By focusing efforts on a few critical workstreams, our client successfully navigated a disruptive change, repositioning themselves for a profitable future in the mortgage insurance business. The Department of Homeland Security’s biometric technology program needed to nearly triple its workforce and transform its HR capabilities. 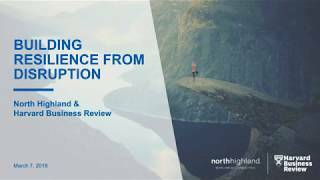 North Highland helped them improve employee recruitment, stabilize retention and better support national safety.